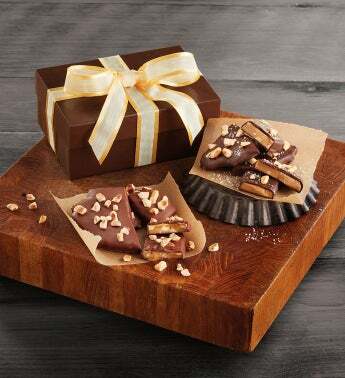 The Toffee Nut Brittle Assortment includes two flavors of handcrafted gourmet toffee candy. Each toffee brittle has the signature toffee crunch and rich, buttery flavor you expect from fine confections. The assortment includes milk chocolate hazelnut toffee brittle and dark chocolate fleur de sel cashew brittle. There's something to delight even the most discerning palate.